In July we met at Out of the Blue in Edinburgh and the Tron Theatre in Glasgow for our monthly Green Tease events. This ongoing series aims to create a platform for new connections and sustained communication between those working in the arts and sustainability in Scotland, offering the opportunity for people working across different fields and sectors to meet, exchange ideas and learn from one another’s practices. The focus of the July events came out of a discussion within the CCS team about how we understand the use-value of the Green Tease network. 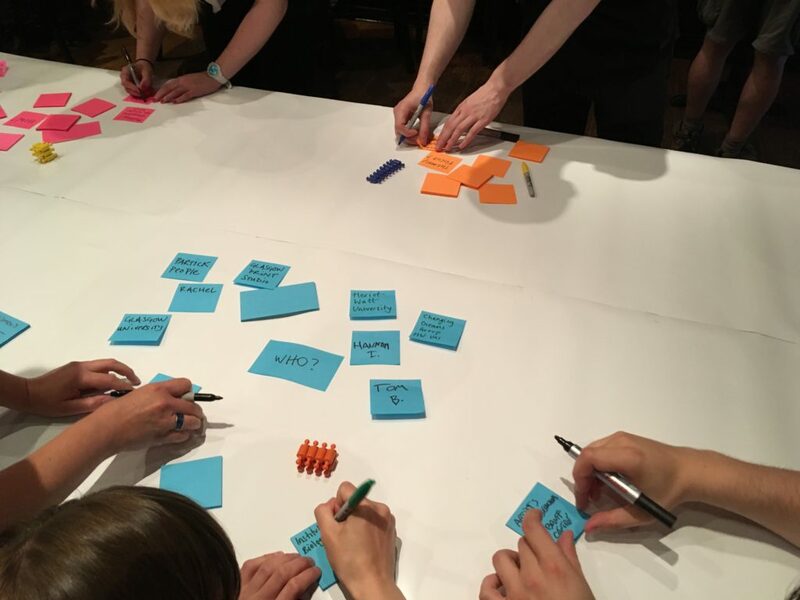 We decided that a network mapping exercise might be a helpful first step towards this and so we approached Larissa Pschetz, interaction designer and researcher at Edinburgh College of Art, to help us design and lead the events. 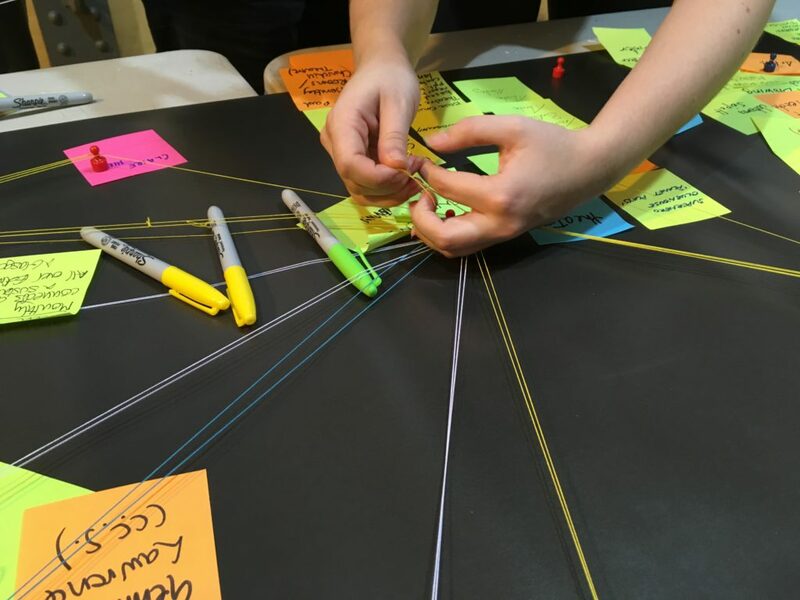 In our early conversations with Larissa we talked about various options for a network map – whether it should manifest in digital or physical form, how we capture a relatively open and changing network such as Green Tease, how we use the information captured to inform future work. We decided that a physical mapping exercise, that was photographed and potentially made into a digital version, would generate the most interesting and helpful results. 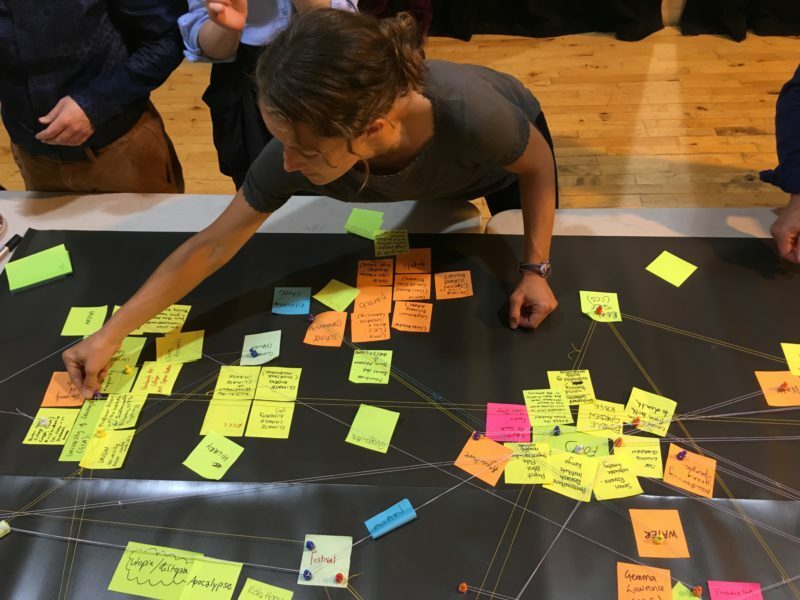 In both Edinburgh and Glasgow participants were invited to share information on past, current and future projects or initiatives they were involved in from either arts or sustainability perspectives. 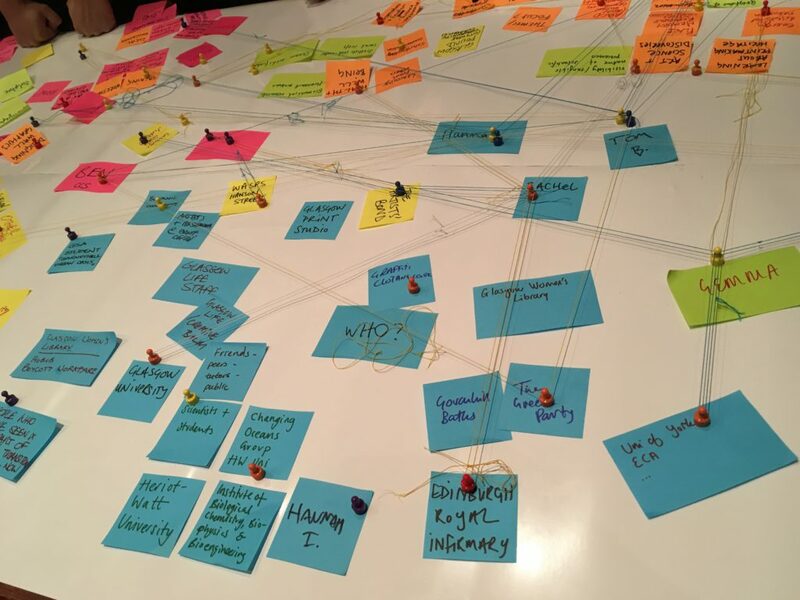 Information was gathered on post-it notes under various categories including: location, individuals and partners involved, processes and methods, themes, and disciplines or fields, and were subsequently connected with magnets and elastic string on a large magnetic sheet. During the activity there was an interesting performativity in the way that participants circled around the table, crossing over each other to place magnets, and stretching to loop their strings between different points on the map. Rather than the map itself, probably the most useful outcomes of the events were the discussions held between members of the group, and the surfacing of approaches that participants were taking to their work that others had not been aware of previously. Interestingly, waste, which is usually a strong focus in discussions about environmental sustainability due to its visual and material dominance, was a lesser feature of either map. Energy on the other hand, was discussed in more depth. 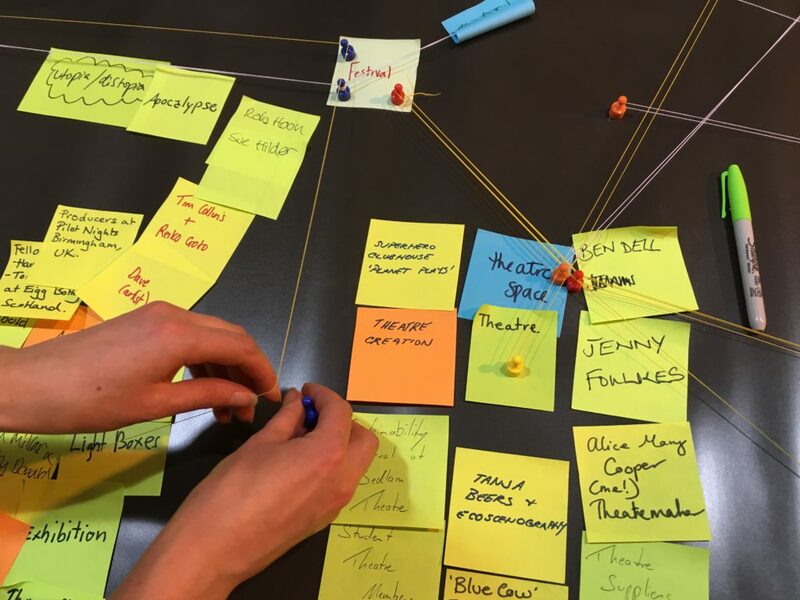 In Edinburgh we talked about the potential role of the artist in non-arts environments, such as energy companies, in making new lateral connections, offering different perspectives on predominant ways of thinking and working, and playing out potential future scenarios. See CCS Director Ben Twist’s recent blog on the ways in which the arts can change the collective thinking of society in relation to sustainability and climate change. In Glasgow, visual artist Hannah Imlach and composer Tom Butler shared their recent experience of the On Energy Residency in Banff, Canada, and their interest in highlighting and re-presenting the ways in which we experience energy through sculpture and sound. For CCS, this highlighted the opportunity to encourage and facilitate discussions of the role of cultural practices in addressing the major questions around future energy generation and consumption in Scotland. Please email gemma.lawrence@creativecarbonscotland.com for access to the full photo documentation of the maps created. Green Tease is an ongoing informal events programme which aims to build connections between creative practices and environmental sustainability, through the exchange of ideas, knowledge and practices. The majority of Green Tease are free to attend with refreshments provided. Find out more here. Interested in running your own Green Tease? We’re now offering members the chance to run their own event with a small budget and support from the CCS team. Take a look at our Open Call! Reflections written by CCS Producer, Gemma Lawrence.